Pinterest is so fun and beautiful and useful, but it can become a mess if you’re not intentional with the way you organize pins. For the next few days, I’m going to be sharing some ways to ultimately save time by initially investing time optimizing your boards. This is going to be a play-along section in my 31 Days series. 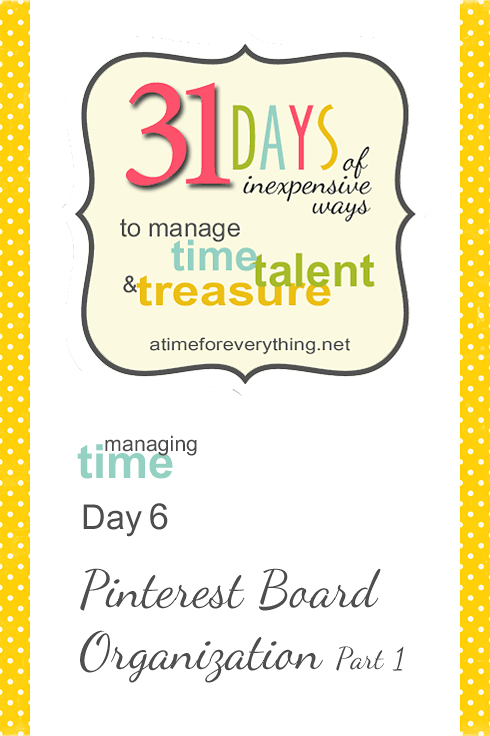 Your first assignment is to choose one of your Pinterest boards that is entirely too jam-packed which makes it difficult to find what you’re looking for… even though you’re pretty sure that’s where you pinned it. Come back tomorrow and we’ll start the process of getting that crazy board broken down into more manageable and useful boards.